Further to my presentations at Snoopcon and DC4420, please find a list of the most relevant references. I'm flattered by the interest I've received, if my ideas had coalesced sooner, and I'd have expected such a response, I would have done this in advance. Thank you for your patience. I've categorised references by type, kind of, I figure that's the easiest way for people to navigate this. Constructive feedback always welcome. Blinky Boxes - Frasier Scott's presentation on threat modelling has slides here: https://speakerdeck.com/zeroxten/threat-modeling-the-ultimate-devsecops I think this is part of his current repetroire, so best caught live of course; or seeing as he's in DevOps, it'll have iterated several times already. CTRL+Break The OODA Loop by Abel Toro of Forcepoint from BSides London 2018 isn't up yet on their channel https://www.youtube.com/channel/UCXXNOelGiY_N96a2nfhcaDA ; it was on Track 3, I'm hoping that was recorded... or that Abel will be giving the presentation again. My main source for Pete Carroll's philosophy, in many senses of the word, is here: https://www.fieldgulls.com/football-breakdowns/2014/2/3/5374724/super-bowl-48-seahawks-pete-carrolls-richard-sherman-marshawn-lynch ; I have a lot of reading to look forward to. Olivia Jeter, Defensive End for Blandensburg High School, is covered in these videos: https://www.youtube.com/watch?v=yAYS2VnfFi8 and https://www.youtube.com/watch?v=5xD8qjihHf8 Yes, I do realise that those videos are from 2014, but she provides such great soundbites, I must find out what happened to her. Jeremiah Grossman on the Kenna Security report, highlighting 2% of vulnerabilities are exploited, is here: https://twitter.com/jeremiahg/status/996469856970027008 I've got into interesting discussions on how true or untrue that figure may be, watch this space. Banks using mobile phone companies ... dammit, I had a single reference, which I think was a line or two in an article I had to use archive.org to source, but looking for "banks learning from" online there's many industries and many examples. The Caffrey Triangle is mentioned here https://paxsims.wordpress.com/2016/08/19/connections-2016-conference-report/ , I've had it explained to me in person, we all need to be talking about this a lot more, in both cyber security and wargaming. Practice - "any incident response plan is only as strong as the practice that goes into it" is from Mike Peters, Vice President of RIMS, the industry body for Risk Management. Best to search online for that specific quote and use whichever source will look best in your board level presentation. Sometimes I get the gist of something and use that. If you know any of these ideas better than I do, meaning that I've missed a nuance, or not read an important reference, please do get in touch. I always appreciate constructive corrections. I've had a bunch of Bluetooth keyboards kicking around for ages ( I suspect at least two years ). I've only used a couple of them a couple of times, so I've finally decided to give them a quick try-out - so I thought I'd put those reviews up here in case they turn up in an online search and someone finds them useful. But they have been sat in the To Do pile for quite some time, so make and model are best guesses. Note that I just typed on each one for three lines or, while sat properly at a desk, within two feet of the Android phone I was using for testing. do say so in the comments and I'll figure that out. I don't know this specific make and model so all I can say is to avoid the really cheap stuff. While this did appear to replicate what I typed on the screen it has a weird double space bar, the keys feel genuinely awful, and the USB power connector is Micro A. So that'll be this one: https://www.amazon.co.uk/Bluetooth-Ultra-Slim-Aluminum-Keyboard-Windows/dp/B00BKW2410 - do note that searcher for this model will actually bring up a newer version. Works nicely on my Android phone, pretty big size, and I had this one relatively loose in a large bag, so the middle is something like 2mm higher than the edges, but it still works. OK if you want a decent size keyboard, but you'll want it in a firm bag. This is reasonable enough to type on - it's essentially a "meh" keyboard, which is the best you can expect from something portable. Also it folds up nicely and appears to be suitably rugged, so something that will slip into a pocket or smaller bag. Note it doesn't have a right CTRL key, which just might be important to you. Also the layout is, er, American, I think. Pretty sure this is this one: http://www.zoomtel.com/products/9010.html ... hmmm, this was left on a low power charger ( 500mA or so ) overnight, then left switched off for a few days, and had no charge left. It has a row of media keys along the top, with what I think are a "home button" key and a "lock screen" key. Seems rugged enough too, not sure about that charge going away. Also bear in mind the power socket is USB Mini-B, not Micro-B. 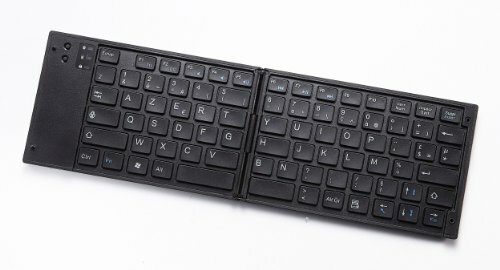 The key positioning is too weird on this one - the EC Technology foldable keyboard is OK because it folds a quarter of the way in from either end, this keyboard folds in the middle - which means the centre of the space bar I tend to hit is the join, the right shift is in a weird place, and the placement of the keys in the middle detracts from ease of use. Only the foldable keyboards will fit in the smallest of my bags, along with a phablet and a spare battery... so I like the idea of them, but they don't seem to work in practice, at least without spending more money. In an earlier blog here I stated I was going to use a Targus device that combined the functionality of being a wireless mouse, and a wireless remote control for presenting; rare functionality that is exactly what I was after. As stated... it does work with Linux, but only for short periods of time. Sometimes it can only last for a couple of minutes before it just kind of forgets that it was talking to something else. This makes it completely unusable for presentations, and essentially completely worthless. Reading through the Amazon reviews more thoroughly, it looks like I'm not the only one with this problem. I realise the device was on the "cheap and cheerful" side but I expected basic functionality, rather than no functionality. Suggestions for equivalent but reliable devices would be appreciated in the comments. "although it's unpleasant, you do want to have nay saying voices involved in any sort of decision that you make"
As a former penetration tester, and sporadic wargamer, I am completely sold on the "red team" concept. For those of you not familiar with the area, I'd describe it as "having someone or something with an adversarial mindset examine your nascent idea or project or hypothesis for flaws from the point of view of sentient opposition, and also to extrapolate the second and third order effects from the implementation of that idea". I am still surprised at how rare this point of view is, although I realise that I might be preaching to the converted. "There are some helpful points that psychology suggests in order to avoid overconfidence that leads you over the cliff, if you will. The first is that, although it's unpleasant, you do want to have nay saying voices involved in any sort of decision that you make. That is, you want someone to play devil's advocate. Basically to poke holes in what the group or the institution might be thinking about what it wants to do. The reason for that is, having a devil's advocate can help the organization spot when it's being overconfident. Or, sometimes just improve the decision that the institution’s going to do. So you want that." "Having a devil’s advocate is unpleasant ... but what it does do is it does insulate you against unknown incompetence. And you just know that it’s going to show up sooner or later, you just don’t know where. So you might as well just have these policies that help you address the problems that you can’t anticipatewhen they finally rear up and try to bite you." You've somehow stumbled across this blog post because you want to know if Prototype 2 is worth playing. I played it on the Xbox360 and really enjoyed it. "Tear your way through the quarantined streets of Manhattan, crushing tanks and ripping apart horrific mutants, with awesome super-mutant powers of your own. You are Sgt James Heller, a soldier and grieving husband, taking down everyone responsible for the murder of your family, and have your revenge!" An offline game, no connectivity is required, there's no multi-player options. I think some of the "RADNet" functionality will have gone away if you're offline or buying this game so late that it's been removed from Xbox Live servers, but all you'll be missing are some side quests that mainly involve running across rooftops or throwing barrels into incinerators. A game where you don't have to think that hard... as you can see from the summary above, contrary to my last game, Remember Me, in this case you're definitely in the "I'm a gruff male, and I need to avenge the loss of someone or something by killing everything in range" zone. Hilariously over the top and indiscriminate combat - it would have been interesting to have a penalty for injuring or killing the citizens you're apparently there to protect, but due to the auto-aiming combat system and area effect of the weapons you'll obtain you'll find yourself shredding anything that gets in-between you and your target... whether you want to or not. At the start of the game those civilians will be bystanders you try to avoid, by one hour in they're just wandering health packs. A game that isn't that difficult. I think I'm of about average ability for a video game player, and this game was only slightly challenging on Normal level. At least 20 hours of time according to gamelengths.com, I'm sure I took longer, maybe 30 or 40. No squick about blood or tendrils, there is a lot of cutting people apart in this game, or literally pulling them to pieces; and you obtain information from adversaries by literally consuming and absorbing them. An acceptance of "game logic", you can evade helicopters chasing you by running around a corner and switching to a different identity, you gain powers by collecting things because that's what happens in video games, there are boss fights because there are always boss fights. No extra cash, the DLC is all essentially optional as far as I could tell. "A Good Day To Die Hard" is the fifth instalment in the Die Hard series of films, an engaging set of action packed movies, so should you watch this one? TL;DR - no, don't watch this film. If you're after a good film - it just isn't. There's no real suspense, the characters aren't engaging, the actors are capable of much better performances, and the interesting twist isn't enough to save it... and for an action film, the action is disappointing.Check out IMDB and Rotten Tomatoes for similar but more comprehensive reviews. If you're after a mindless action film - don't watch this, the actions sequences are somehow boring... there's armoured personnel carriers barrelling through the streets of Moscow, there's helicopters on fire, and I didn't care. Maybe it needs a large screen and surround sound, but the dramatic events just didn't engage me, and there's a lot of "but that wouldn't happen", "why is that character doing that? ", "why has there been no police response at all", and "maybe we should just fast forward through this bit". If you're after a "good bad" film - I will blog more about these in future, as myself and a few friends are fans of "so bad they're good" films... but this film isn't in that class, it isn't that kind of bad; it's just perplexing and confusing. You've somehow stumbled across this blog post because you want to know if Remember Me is worth playing. I played it on the Xbox360 and really enjoyed it. Neo-Paris. 2084. Personal memories can now be digitised, bought, sold and traded. The last remnants of privacy and intimacy have been swept away in what appears to be a logical progression of the explosive growth of social networks at the beginning of the 21st century. The citizens themselves have accepted this surveillance society in exchange for the comfort only smart technology can provide. This memory economy gives immense power over society to just a handful of people. Remember Me™ is a 3rd person action adventure where players take on the role of Nilin, a former elite memory hunter with the ability to break into people’s minds and steal or even alter their memories. An offline game, no connectivity is required, there's no multi-player options. A different kind of protagonist and therefore a different drive for the story. It's enjoyable to have the reason behind your actions in the game be something different from "I'm a gruff male, and I need to avenge the loss of someone or something by killing everything in range". Scenery that looks good. Even on my Xbox360 I sometimes just stopped to look around. A relaxing time - apart from some difficult fights, a lot of time you are progressing through what is essentially an interactive movie. While there is a lot of leaping around to do, it just involves directing the main character, Nilin, to the correct location and pressing the jump button, rather than having any specific aiming or timing requirements for the leap; so it's engaging rather than taxing. About 8 to 16 hours of time according to reviews on line, most notably this site http://www.gamelengths.com/games/playtimes/Remember+Me/ . I'm an averagely skilled player, and while the game doesn't tell me how long I played it for, I'm pretty sure it was over 16 hours. Some suspension of disbelief, the AI can be ropey and predictable, the "hit people to regain health" idea doesn't survive scrutiny... but it's just a game, to me the world was so well built I found it easy to go with the flow rather than be thrown out of the game by a "fridge moment". Patience for some of the boss fights. I mostly found them challenging rather than insurmountable, although a couple were in the "I'll try again tomorrow" class; and there's plenty of advice online on how to defeat particular opponents. The best description of this podcast is from its website on http://themessagepodcast.com/. The Message is a new podcast following the weekly reports and interviews from Nicky Tomalin, who is covering the decoding of a message from outer space received 70 years ago. Over the course of 8 episodes we get an inside ear on how a top team of cryptologists attempt to decipher, decode, and understand the alien message. Each week she’ll bring you the latest chapter, so it’s important to listen in starting with Episode 1. The Message is a co-production between Panoply and GE Podcast Theater, unlocking the secrets of healing with sound technology. I'd be surprised if it's not quite different to what you usually listen to, whoever you are, so it's recommended if you want a break - my subscriptions are mostly around information security, with the occasional Radio 4 comedy and sports podcast thrown in, and quite a lot of Nerdist interviews... this was definitely a change of pace. To listen to them all you'll need just under two hours and probably a mild suspension of disbelief as I'm not sure about some of the science on radio and audio and biology; but I'd be interested to hear thoughts from anyone knowledgeable in that area.